Hailing from The City of Brotherly Love, Fencewalker is spinning the love in a mellow folk melodic tapestry. Her eight track, forthcoming release Mourning the Whale embodies simple independence and passion. Fencewalker is the vividly appropriate moniker undertaken by Brianna Johnson. Each track feels like you’re walking along a simple setting accompanied by grace and heart. It is as if the eight tracks are a window to a simpler way of being. Out of the gate “Shoulders” hands a middle-of-nowhere roadhouse jam style led by a heavy kick-drum beat and swaggering slide. Though this early Cheryl Crow-like track feels raw bluesy and often off-beat, there’s a level of sincerity and honesty that is often produced out of sound. 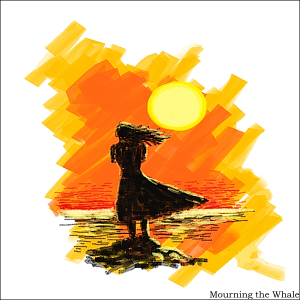 Mourning the Whale is more the name of an intimate venue than an album title. As the record progresses into Cat Power induced simplicity it finds warmth within its own skin. By the time we reach “Forts” and “Religion” we’re well within a comfort zone that’ll have you kicking off your shoes and settling down with your drink of choice to play out the rest of the illuminating experience. To discover an artist like Fencewalker is fine enough, but for the artist to release an album in this capacity is something to admire. There is no glitz, glam or overly refined production on Mourning the Whale. Instead, it holds near and dear to originality and the purity of the art. Sure it could be driven into the ground that the cuts between songs feel a bit off or the instrumentals fall off synch at very few moments. To that I say get out. Get out of the album that made up such a beautifully crafted piece of folk. If you dwell on that then you’re missing the point. For those who are sticking around, I say cheers, what else does this beautiful sound have in store? This entry was posted in Reviews and tagged Bandcamp, Brianna Johnson, Cat Powers, Cheryl Crow, Fencewalker, mourning the whale, music, nanobot, review by Greg. Bookmark the permalink.